Inspired by his father’s battle with diabetes, UrbMat founder and CEO Phil Weiner set out to create a foolproof way for everyone to experience the health benefits of homegrown food. 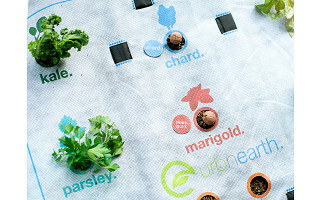 In fact, for every UrbMat purchased, the company works with 2 Degrees Food and Feeding America to donate two meals to kids suffering from hunger in the U.S. Made in the USA, UrbMat is a small-space garden solution that takes the guesswork out of growing your own herbs, vegetables, and flowers including arugula, basil, carrots, catnip, cilantro, chard, lettuce, marigold, parsley, kale, radish, and spinach. No farmland or green thumb necessary. All you need is a small area of dirt or a raised bed 3X2 feet in size to get started. Based on the concept of companion gardening where certain plant combinations help each other grow, UrbMat delivers the optimal vegetable garden layout. The mat is also designed to inhibit weeds and maintain ideal moisture levels. Simply lay UrbMat on top of the soil, match each of the 12 GrowUps containing a mix of chili powder, compost, worm castings, clay and non-GMO seeds to its corresponding color coded square on the mat, gently press the GrowUps into the soil, and prepare to receive a bounty of home grown goodness. You don’t even have to dig any holes. Now that’s what we call clean eating. Hi there - I'm Phil! I'm excited to introduce you to a new way of growing using the UrbMat. 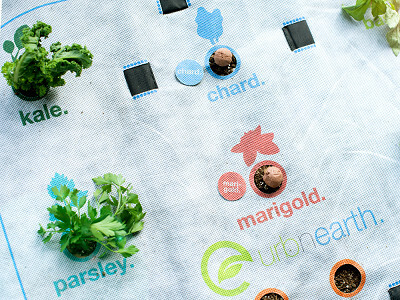 Now all you need to start growing vegetables is an UrbMat and your thumb (and it doesn’t even have to be green!) I look forward to answering your questions and growing with you this year! @Laurie Hi Laurie - thanks for the questions. Right now the UrbMat comes with the standard 12 types of herbs vegetable and flowers. We're still growing (no pun intended) and will have more options in the future. Thanks for your interest in the UrbMat. What was the answer to this question ? Can you cut it up? Or do you make smaller ones, with less seeds? And can you just buy the SEEDS for growing again? Or do I have to have a new Matt every time ? Thanks. I'm loving this item !! It's cool ! @Cindy Hi Cindy - the UrbMat is reusable. Meaning every season you just order more GrowUps. We only offer the irrigated version but you can also water it by hand. We'll try to take care of you if you want something special. Thanks for the kind words. Hi Jamie, you can certainly resize the UrbMat for your planter boxes that are self watering if you wish. Just be sure to remove the irrigation and resize the mat using a yardstick and a pair of shears. Order more GrowUps refills as you harvest and replant. I used to build raised gardens for folks wheel chair bound at a convalescent home; it was one of the purest joys of my life. I applaud you for comming up with this idea, what a knockout. My question is this: Do the flowers selected have a job or are they there strictly for the beauty. I am sorry if this was covered in the video, I am at work and cannot view them here. @Fred - Great question - the placement and location of every plant serves a purpose on the UrbMat. Each plant has been paced according to a companion planting method. For example - basil deters flies, catnip attracts lacewings, which prey on pests and marigolds can deter flies as well as nematodes. Not to mention catnip makes a wonderful herbal tea and cats love it! Thanks for the great question. Hi Phil, will you be making a smaller version? @Richard - Absolutely! Right now we are only offering the 3' x 2' but we will certainly explore adding other products to The Grommet offering. Thanks for your interest. Hi Phil: How will the UrbMat grow in full sun? @Julie - The UrbMat will grow better than ever in full sun. Almost all vegetables and herbs crave full sunlight. You should see faster growth with 4-8 hours of sunlight. Thanks again. Are you the same product that started up with Kickstarter? Hi @Elizabeth - We did not get our start on Kickstarter. Is it possible to plant two UrbMats together using the same hose system? Also, it looks like there are two hose hookups. What product do you recommend to split the hose? Hi @Denise - YES! In fact you can daisy chain the UrbMats water both at the same time by using a short hose called a 'leader hose'. You can even put your hose on a timer and have the UrbMat watered automatically. Hey everyone, Grommet CEO here. I was so excited about the UrbMat as soon as I saw it...it's so smart and practical. And its weed deterrent feature reminded me of an early Grommet that has since gone out of business. It was called Growing Grids and I use them to this day in my vegetable garden. It had a very similar planting sytem (channels) and weed deterrent. I love it. But the UrbMat goes further in really helping your plan the garden and with the irrigation system--when you get the spacing, weeding, and watering under control you are most of the way to success. Do remember to till the soil before settling the UrbMat in place. Happy growing! Inspired by his father’s battle with diabetes, UrbMat founder and CEO Phil Weiner set out to create a foolproof way for everyone to experience the health benefits of homegrown food. 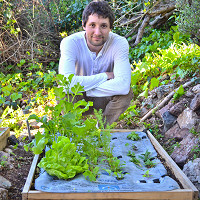 In fact, for every UrbMat purchased, the company works with 2 Degrees Food and Feeding America to donate two meals to kids suffering from hunger in the U.S.
Made in the USA, UrbMat is a small-space garden solution that takes the guesswork out of growing your own herbs, vegetables, and flowers including arugula, basil, carrots, catnip, cilantro, chard, lettuce, marigold, parsley, kale, radish, and spinach. No farmland or green thumb necessary. All you need is a small area of dirt or a raised bed 3X2 feet in size to get started. Based on the concept of companion gardening where certain plant combinations help each other grow, UrbMat delivers the optimal vegetable garden layout. The mat is also designed to inhibit weeds and maintain ideal moisture levels.